In the Enzyme unit students learn about the structure of the enzyme and the factors affecting enzyme activity. Enzymes control the metabolism of the cell. ​2.5.U1 Enzymes have an active site to which specific substrates bind. 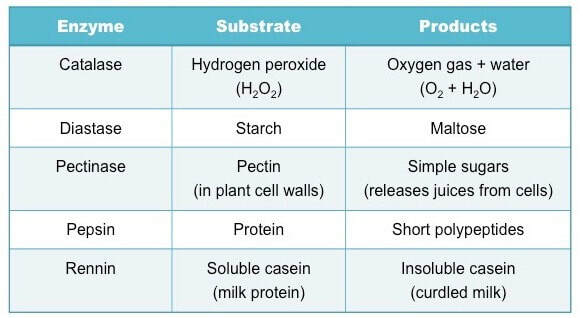 State the relationship between enzyme substrate and enzyme product. 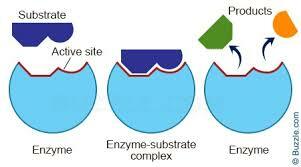 Outline the three stages of enzyme activity. Explain the role of random collisions in the binding of the substrate with the enzyme active site. Explain how temperature affects the rate of enzyme activity. Draw a graph of depicting the effect of temperature on the rate of enzyme activity. Explain how pH affects the rate of enzyme activity. Draw a graph of depicting the effect of pH on the rate of enzyme activity. Identify the optimum temperature or pH for enzyme activity on a graph. Explain how substrate concentration affects the rate of enzyme activity. Changing the Enzyme and Substrate concentrations affect the rate of reaction of an enzyme-catalysed reaction. Controlling these factors in a cell is one way that an organism regulates its enzyme activity and so its Metabolism. Changing the concentration of a substance only affects the rate of reaction if it is the limiting factor: that is, it the factor that is stopping a reaction from preceding at a higher rate. If it is the limiting factor, increasing concentration will increase the rate of reaction up to a point, after which any increase will not affect the rate of reaction. This is because it will no longer be the limiting factor and another factor will be limiting the maximum rate of reaction. As a reaction proceeds the rate of reaction will decrease, since the Substrate will get used up. The highest rate of reaction, known as the Initial Reaction Rate is the maximum reaction rate for an enzyme in an experimental situation. However, this too will only have an effect up to a certain concentration, where the Enzyme Concentration is no longer the limiting factor..
​2.5.U4 Enzymes can be denatured. The important part of an enzyme is called the active site. This is where specific molecules bind to the enzyme and the reaction occurs. Anything that changes the shape of the active site stops the enzyme from working. This is similar to a key that opens a door lock. It does not matter what a key handle looks like, but if you change the shape of the ‘teeth’ the key no longer works. The shape of the active site is affected by pH. This is why enzymes will only work at a specific pH, as well as a specific temperature. Change the pH and the enzyme stops working. Increasing the temperature to 60°C will cause a permanent change to the shape of the active site. This is why enzymes stop working when they are heated. We say they have become denatured. ​2.5.U5 Immobilized enzymes are widely used in industry. List industries that use commercially useful enzymes. Enzyme immobilization is the process of confining the enzyme molecule to a distinct phase from the one where in the substrates and the products are present. This allows the enzyme to retain its catalytic activity and be repeatedly and continuously used. Wastewater management – treatment of sewage and industrial effluents. 2.5.A1 Methods of production of lactose-free milk and its advantages. State the source of the lactase enzyme used in food processing. State the reaction catalyzed by lactase. Lactose is the sugar found in milk. It can be broken down by the enzyme lactase into glucose and galactose. However some people lack this enzyme and so cannot break down lactose leading to lactose intolerance. Lactose intolerant people need to drink milk that has been lactose reduced. Lactose-free milk can be made in two ways. The first involves adding the enzyme lactase to the milk so that the milk contains the enzyme. The second way involves immobilizing the enzyme on a surface or in beads of a porous material. The milk is then allowed to flow past the beads or surface with the immobilized lactase. This method avoids having lactase in the milk. 2.5.S2 Experimental investigation of a factor affecting enzyme activity. Describe three techniques for measuring the activity of an example enzyme. What is an appropriate range of values to select for your independent variable? Have you chosen a sufficient time period for the reaction to proceed? Have you identified, and controlled, all relevant extraneous variables? Can you include a negative control condition (no enzyme) to establish baseline readings? Can you include a positive control condition to confirm enzyme activity? Is it possible to treat the enzyme with the independent variable before mixing with the substrate? 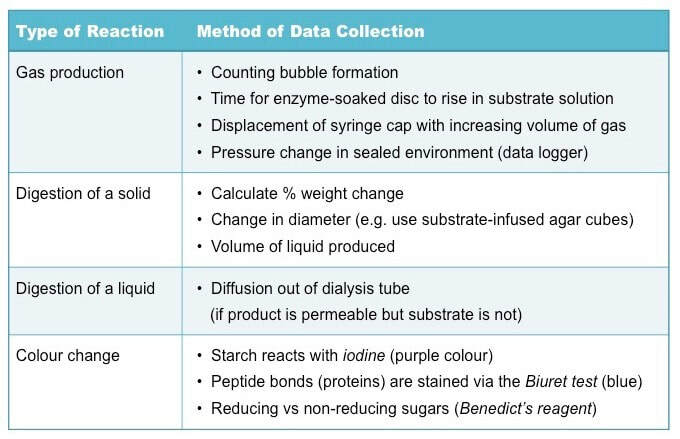 Does the data collection method allow for sufficient precision in detecting changes to levels of product / substrate? Have all appropriate safety precautions been taken when handling relevant substances? Paul Andersen explains how enzymes are used to break down substrates. The correct shape of the active site allows a key/lock fit between the enzyme and the substrate. The enzyme catalase is used to break down hydrogen peroxide. The importance of cofactors and coenzymes is emphasized. Competitive and allosteric inhibition is also included. Dr. Kiki breaks down the breakdown of proteins.